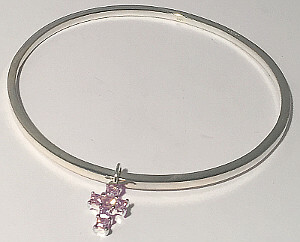 Sterling Silver solid Round Bangle with Pink CZ set Cross Charm attached. Round 925 bangle approx. 68mm internal diameter and approx 12mm size Pink CZ Cross Charm size. Solid bangle approx. ½ oz (14 grams). Sterling Silver Wavy design Bangle set with a single Diamond, 62mm diameter. Sterling Silver Triple branched cross-over open end design Bangle set with two CZ rectangular stones. Unique wavy design bangle with triple branches set with sparkling CZ stones. Approximate internal diameter 65mm x 55mm. 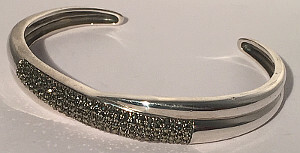 Sterling Silver hinged bangle with a row of CZ stones. Brilliant sparkling row of stones set in an approx. 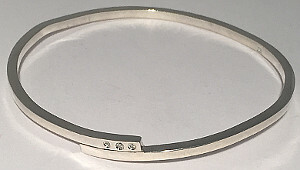 4mm wide 925 bangle with tongue type clasp and securing clip. Fitting internal diameter approx. 60mm x 48mm. Ladies Sterling Silver Marcasite set Open style cross design sparkling marcasite Bangle. Fitting internal diameter 60mm x 45mm approximately. 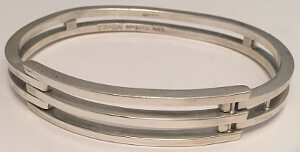 Sterling Silver solid Ladies Bangle with Double Bar face. Width approx. 8mm at widest point, internal diameter approx. 65mm x 45mm. Over ½ oz weight. Sterling Silver Ladies heavy filigree design Solid Bangle with Triple Bar face. Width approx. 12mm at widest point, internal diameter approx. 60mm x 48mm. Heavy weight approx. 1oz. 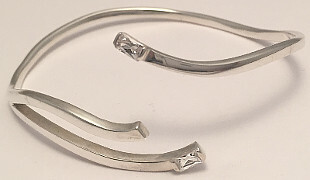 Sterling Silver Ladies Bangle set with a row of genuine Diamonds to 0.23 Carat weight of stones. Sterling Silver Wavy shape elegant Bangle set with three Diamonds at front. 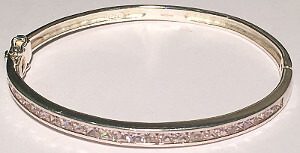 Solid 2mm bangle body with cross-over ends design set with Diamonds. Internal fitting diameter approximately 60mm. Clear Stone set United Colors of Benetton Stud open ended Torque design Bangle. United Colors of Benetton Sterling Silver Open Torque Red Gem set Branded Bangle. Designer Red stone set studded 925 Bangle. 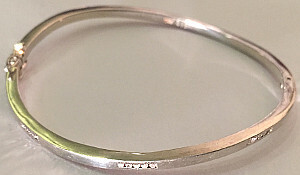 Sterling Silver Oval hinged Bangle set with Pink CZ, including double safety clips. Internal diameter approx. 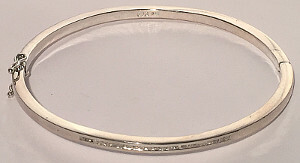 63mm x 53mm, bangle body width approx. 4.5mm. 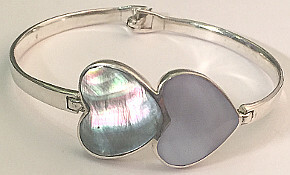 Double Heart design bracelet Bangle set with Shell and Mother of Pearl. Sterling Silver 20mm wide Cuff Bangle set with large Mother of Pearl stone. Heavy solid 1oz Cuff open Torque Mother of Pearl bangle with internal fitting diameter approx. 60mm x 50mm. Sterling Silver Waves design ladies Bangle set with 15 real Diamonds totalling 0.15 Carat. 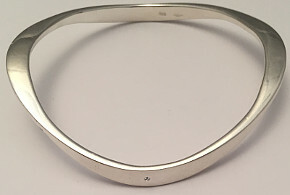 Elegant bangle with secure tongue clasp and two safety clips, internal diameter 60mm x 56mm approximately.